Environmentally sustainable design (also called environmentally conscious design, eco design etc.) is the philosophy of designing physical objects, the built environment, and services to comply with the principles of ecological sustainability. Note: Social and economic factors are vitally important considerations, but are sub systems in the larger context of the Earth's eco-sphere. The intention of sustainable design is to "eliminate negative environmental impact completely through skillful, sensitive design". Manifestations of sustainable design require renewable resources, impact the environment minimally, and connect people with the natural environment. “Human beings don't have a pollution problem; they have a design problem. If humans were to devise products, tools, furniture, homes, factories, and cities more intelligently from the start, they wouldn't even need to think in terms of waste, or contamination, or scarcity. Good design would allow for abundance, endless reuse, and pleasure.” - The Upcycle by authors Michael Braungart and William McDonough, 2013. A problem arises when the limits of a resource are hard to see, so increasing investment in response to diminishing returns may seem profitable as in the Tragedy of the Commons, but may lead to a collapse. This problem of increasing investment in diminishing resources has also been studied in relation to the causes of civilization collapse by Joseph Tainter among others. This natural error in investment policy contributed to the collapse of both the Roman and Mayan, among others. Relieving over-stressed resources requires reducing pressure on them, not continually increasing it whether more efficiently or not. Plans for Floriade 2012 in Venlo, the Netherlands: "The Greenest Building in the Netherlands - no external fuel, electricity, water or sewage." About 80 million tonnes of waste in total are generated in the U.K. alone, for example, each year. And with reference to only household waste, between 1991/92 and 2007/08, each person in England generated an average of 1.35 pounds of waste per day. Experience has now shown that there is no completely safe method of waste disposal. All forms of disposal have negative impacts on the environment, public health, and local economies. Landfills have contaminated drinking water. Garbage burned in incinerators has poisoned air, soil, and water. The majority of water treatment systems change the local ecology. Attempts to control or manage wastes after they are produced fail to eliminate environmental impacts. The toxics components of household products pose serious health risks and aggravate the trash problem. In the U.S., about eight pounds in every ton of household garbage contains toxic materials, such as heavy metals like nickel, lead, cadmium, and mercury from batteries, and organic compounds found in pesticides and consumer products, such as air freshener sprays, nail polish, cleaners, and other products. When burned or buried, toxic materials also pose a serious threat to public health and the environment. The only way to avoid environmental harm from waste is to prevent its generation. Pollution prevention means changing the way activities are conducted and eliminating the source of the problem. It does not mean doing without, but doing differently. For example, preventing waste pollution from litter caused by disposable beverage containers does not mean doing without beverages; it just means using refillable bottles. Waste prevention strategies In planning for facilities, a comprehensive design strategy is needed for preventing generation of solid waste. A good garbage prevention strategy would require that everything brought into a facility be recycled for reuse or recycled back into the environment through biodegradation. This would mean a greater reliance on natural materials or products that are compatible with the environment. consuming less resources means creating less waste, therefore it reduces the impact on the environment. Perhaps the most obvious and overshadowing driver of environmentally conscious sustainable design can be attributed to global warming and climate change. The sense of urgency that now prevails for humanity to take actions against climate change has increased manifold in the past thirty years. Climate change can be attributed to several faults; and improper design that doesn't take into consideration the environment is one of them. While several steps in the field of sustainability have begun, most products, industries and buildings still consume a lot of energy and create a lot of pollution. Unsustainable environment design, or simply design, also affects the biodiversity of a region. Improper design of transport highways force thousands of animals to move further into forest boundaries. Poorly designed hydrothermal dams affect the mating cycle and indirectly, the numbers of local fish. Design for reuse and recycling: "Products, processes, and systems should be designed for performance in a commercial 'afterlife'." Design impact measures for total carbon footprint and life-cycle assessment for any resource used are increasingly required and available.^ Many are complex, but some give quick and accurate whole-earth estimates of impacts. One measure estimates any spending as consuming an average economic share of global energy use of 8,000 BTU (8,400 kJ) per dollar and producing CO2 at the average rate of 0.57 kg of CO2 per dollar (1995 dollars US) from DOE figures. Sustainable design standards and project design guides are also increasingly available and are vigorously being developed by a wide array of private organizations and individuals. There is also a large body of new methods emerging from the rapid development of what has become known as 'sustainability science' promoted by a wide variety of educational and governmental institutions. Biomimicry: "redesigning industrial systems on biological lines ... enabling the constant reuse of materials in continuous closed cycles..."
Service substitution: shifting the mode of consumption from personal ownership of products to provision of services which provide similar functions, e.g., from a private automobile to a carsharing service. Such a system promotes minimal resource use per unit of consumption (e.g., per trip driven). Robust eco-design: robust design principles are applied to the design of a pollution sources. A model of the new design principles necessary for sustainability is exemplified by the "Bill of Rights for the Planet" or "Hannover Principles" - developed by William McDonough Architects for EXPO 2000 that was held in Hannover, Germany. Insist on the right of humanity and nature to co-exist in a healthy, supportive, diverse, and sustainable conditions. Rely on natural energy flows. Human designs should, like the living world, derive their creative forces from perpetual solar income. Incorporating this energy efficiently and safely for responsible use. Understand the limitations of design. No human creation lasts forever and design does not solve all problems. Those who create and plan should practice humility in the face of nature. Treat nature as a model and mentor, not an inconvenience to be evaded or controlled. Bringing the existing built environment up to sustainable design standards. In addition, the Interprofessional Council on Environmental Design (ICED), a coalition of architectural, landscape architectural, and engineering organizations, developed a vision statement in an attempt to foster a team approach to sustainable design. ICED states: The ethics, education and practices of our professions will be directed to shape a sustainable future. . . . To achieve this vision we will join . . . as a multidisciplinary partnership." These activities are an indication that the concept of sustainable design is being supported on a global and interprofessional scale and that the ultimate goal is to become more environmentally responsive. The world needs facilities that are more energy efficient and that promote conservation and recycling of natural and economic resources. Environmentally sustainable design is most beneficial when it works hand in hand with the other two counterparts of sustainable design – the economic and socially sustainable designs. These three terms are often coined under the title ‘triple bottom line.’ It is imperative that we think about value in not solely economic or financial terms, but also in relation to natural capital (the biosphere and earth's resources), social capital (the norms and networks that enable collective action), and human capital (the sum total of knowledge, experience, intellectual property, and labor available to society). The purely economic capital so many people and organizations strive for, and make decisions by, are often not conducive to these alternative forms of capital. For sustainable design, there is a need to reset how we, as inhabitants of the earth, think about value. In some countries the term sustainable design is known as ecodesign, green design or environmental design. Victor Papanek, embraced social design and social quality and ecological quality, but did not explicitly combine these areas of design concern in one term. Sustainable design and design for sustainability are more common terms, including the triple bottom line (people, planet and profit). In the EU, the concept of sustainable design is referred to as ecodesign. Little discussions have however taken place over the importance of this concept in the run-up to the circular economy package, that the European Commission will be tabling by the end of 2015. To this effect, an Ecothis.EU campaign was launched to raise awareness about the economic and environmental consequences of not including eco-design as part of the circular economy package. According to Jonathan Chapman of Carnegie Mellon University, USA, emotionally durable design reduces the consumption and waste of natural resources by increasing the resilience of relationships established between consumers and products." Essentially, product replacement is delayed by strong emotional ties. In his book, Emotionally Durable Design: Objects, Experiences & Empathy, Chapman describes how "the process of consumption is, and has always been, motivated by complex emotional drivers, and is about far more than just the mindless purchasing of newer and shinier things; it is a journey towards the ideal or desired self, that through cyclical loops of desire and disappointment, becomes a seemingly endless process of serial destruction". Therefore, a product requires an attribute, or number of attributes, which extend beyond utilitarianism. Narrative: How users share a unique personal history with the product. Consciousness: How the product is perceived as autonomous and in possession of its own free will. Attachment: Can a user be made to feel a strong emotional connection to a product? Fiction: The product inspires interactions and connections beyond just the physical relationship. Surface: How the product ages and develops character through time and use. Because standards of sustainable design appear to emphasize ethics over aesthetics, some designers and critics have complained that it lacks inspiration. Pritzker Architecture Prize winner Frank Gehry has called green building "bogus," and National Design Awards winner Peter Eisenman has dismissed it as "having nothing to do with architecture." In 2009, The American Prospect asked whether "well-designed green architecture" is an "oxymoron." Others claim that such criticism of sustainable design is misguided. A leading advocate for this alternative view is architect Lance Hosey, whose book The Shape of Green: Aesthetics, Ecology, and Design (2012) was the first dedicated to the relationships between sustainability and beauty. Hosey argues not just that sustainable design needs to be aesthetically appealing in order to be successful, but also that following the principles of sustainability to their logical conclusion requires reimagining the shape of everything designed, creating things of even greater beauty. Reviewers have suggested that the ideas in The Shape of Green could "revolutionize what it means to be sustainable." Small and large buildings are beginning to successfully incorporate principles of sustainability into award-winning designs. 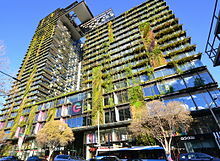 Examples include One Central Park and the Science Faculty building, UTS. The popular Living Building Challenge has incorporated beauty as one of its petals in building design. Sustainable products and processes are required to be beautiful because it allows for emotional durability. Many people also argue that biophilia is innately beautiful. Which is why building architecture is designed such that people feel close to nature and is often surrounded by well-kept lawns – a design that is both ‘beautiful’ and encourages the inculcation of nature in our daily lives. Or utilizes daylight design into the system – reducing lighting loads while also fulfilling our need for being close to that which is outdoors. Discussed above, economics is another aspect of it environmental design that is crucial to most design decisions. It is obvious that most people consider the cost of any design before they consider the environmental impacts of it. Therefore, there is a growing nuance of pitching ideas and suggestions for environmentally sustainable design by highlighting the economical profits that they bring to us. "As the green design field matures, it becomes ever more clear that integration is the key to achieving energy and environmental goals especially if cost is a major driver." Building Green Inc. (1999) To achieve the more ambitious goals of the green design movement, architects, engineers and designers need to further embrace and communicate the profit and economic potential of sustainable design measures. Focus should be on honing skills in communicating the economic and profit potential of smart design, with the same rigor that have been applied to advancing technical building solutions. There are several standards and rating systems developed as sustainability gains popularity. The list is endless, with most rating systems revolving around buildings and energy, and some covering products as well. Most rating systems certify on the basis of design as well as post construction or manufacturing. LEED - Leadership in energy and environmental design. While designing for environmental sustainability, it is imperative that the appropriate units are paid attention to. Often, different standards weigh things in different units, and that can make a huge impact on the outcome of the project. Another important aspect of using standards and looking at data involves understanding the baseline. A poor design baseline with huge improvements often show a higher efficiency percentage, while an intelligent baseline from the start might only have a little improvement needed and show lesser change. Therefore, all data should ideally be compared on similar levels, and also be looked at from multiple unit values. Life cycle assessment is the complete assessment of materials from their extraction, transport, processing, refining, manufacturing, maintenance, use, disposal, reuse and recycle stages. It helps put into perspective whether a design is actually environmentally sustainable in the long run. Products such as aluminum which can be reused multiple number of times but have a very energy intensive mining and refining which makes it unfavorable. Information such as this is done using LCA and then taken into consideration when designing. Applications of this philosophy range from the microcosm — small objects for everyday use, through to the macrocosm — buildings, cities, and the Earth's physical surface. It is a philosophy that can be applied in the fields of architecture, landscape architecture, urban design, urban planning, engineering, graphic design, industrial design, interior design, fashion design and human-computer interaction. Sustainable design is mostly a general reaction to global environmental crises, the rapid growth of economic activity and human population, depletion of natural resources, damage to ecosystems, and loss of biodiversity. In 2013, eco architecture writer Bridgette Meinhold surveyed emergency and long-term sustainable housing projects that were developed in response to these crises in her book, “Urgent Architecture: 40 Sustainable Housing Solutions for a Changing World.” Featured projects focus on green building, sustainable design, eco-friendly materials, affordability, material reuse, and humanitarian relief. Construction methods and materials include repurposed shipping containers, straw bale construction, sandbag homes, and floating homes. The limits of sustainable design are reducing. Whole earth impacts are beginning to be considered because growth in goods and services is consistently outpacing gains in efficiency. As a result, the net effect of sustainable design to date has been to simply improve the efficiency of rapidly increasing impacts. The present approach, which focuses on the efficiency of delivering individual goods and services, does not solve this problem. The basic dilemmas include: the increasing complexity of efficiency improvements; the difficulty of implementing new technologies in societies built around old ones; that physical impacts of delivering goods and services are not localized, but are distributed throughout the economies; and that the scale of resource use is growing and not stabilizing. Sustainable architecture is the design of sustainable buildings. Sustainable architecture attempts to reduce the collective environmental impacts during the production of building components, during the construction process, as well as during the lifecycle of the building (heating, electricity use, carpet cleaning etc.) 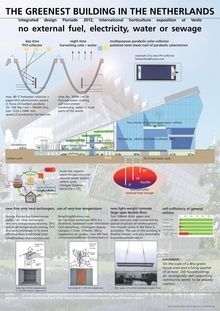 This design practice emphasizes efficiency of heating and cooling systems; alternative energy sources such as solar hot water, appropriate building siting, reused or recycled building materials; on-site power generation - solar technology, ground source heat pumps, wind power; rainwater harvesting for gardening, washing and aquifer recharge; and on-site waste management such as green roofs that filter and control stormwater runoff. This requires close cooperation of the design team, the architects, the engineers, and the client at all project stages, from site selection, scheme formation, material selection and procurement, to project implementation. This is also called a charrette. Appropriate building siting and smaller building footprints are vital to an environmentally sustainable design. Oftentimes, a building may be very well designed, and energy efficient but its location requires people to travel far back and forth – increasing pollution that may not be building produced but is directly as a result of the building anyway. Sustainable architecture must also cover the building beyond its useful life. Its disposal or recycling aspects also come under the wing of sustainability. Often, modular buildings are better to take apart and less energy intensive to put together too. The waste from the demolition site must be disposed of correctly and everything that can be harvested and used again should be designed to be extricated from the structure with ease, preventing unnecessary wastage when decommissioning the building. Another important aspect of sustainable architecture stems from the question of whether a structure is needed. Sometimes the best that can be done to make a structure sustainable is retrofitting or upgrading the building services and supplies instead of tearing it down. Abu Dhabi, for example has undergone and is undergoing major retrofitting to slash its energy and water consumption rather than demolishing and rebuilding new structures. Sustainable architects design with sustainable living in mind. Sustainable vs green design is the challenge that designs not only reflect healthy processes and uses but are powered by renewable energies and site specific resources. A test for sustainable design is — can the design function for its intended use without fossil fuel — unplugged. This challenge suggests architects and planners design solutions that can function without pollution rather than just reducing pollution. As technology progresses in architecture and design theories and as examples are built and tested, architects will soon be able to create not only passive, null-emission buildings, but rather be able to integrate the entire power system into the building design. In 2004 the 59 home housing community, the Solar Settlement, and a 60,000 sq ft (5,600 m2) integrated retail, commercial and residential building, the Sun Ship, were completed by architect Rolf Disch in Freiburg, Germany. The Solar Settlement is the first housing community worldwide in which every home, all 59, produce a positive energy balance. An essential element of Sustainable Building Design is indoor environmental quality including air quality, illumination, thermal conditions, and acoustics. The integrated design of the indoor environment is essential and must be part of the integrated design of the entire structure. ASHRAE Guideline 10-2011 addresses the interactions among indoor environmental factors and goes beyond traditional standards. Green design has often been used interchangeably with environmentally sustainable design. There is a popular debate about this with several arguing that green design is in effect narrower than sustainable design, which takes into account a larger system. Green design focuses on the short term goals and while it is a worthy goal, a larger impact is possible using sustainable design. Another factor to be considered is that green design has been stigmatized by popular personalities such as Pritzker Architecture Prize winner Frank Gehry, but this branding hasn't reached sustainable design. A large part of that is because of how environmentally sustainable design is generally used hand in hand with economically sustainable design and socially sustainable design. Finally, green design is although unintentionally, often associated only with architecture while sustainable design has been considered under a much larger scope. Sustainable engineering is the process of designing or operating systems such that they use energy and resources sustainably, in other words, at a rate that does not compromise the natural environment, or the ability of future generations to meet their own needs. Common engineering focuses revolve around water supply, production, sanitation, cleaning up of pollution and waste sites, restoring natural habitats etc. Achieving a healthy and aesthetic environment for the occupants of a space is one of the basic rules in the art of Interior design. When applying focus onto the sustainable aspects of the art, Interior Design can incorporate the study and involvement of functionality, accessibility, and aesthetics to environmentally friendly materials. The integrated design of the indoor environment is essential and must be part of the integrated design of the entire structure. Improving the overall building performance through the reduction of negative impacts on the environment is the primary goal. Reducing consumption of non-renewable resources, minimizing waste and creating healthy, productive environments are the primary objectives of sustainability. Optimizing site potential, minimizing non-renewable energy consumption, using environmentally preferable products, protecting and conserving water, enhancing indoor environmental quality, and optimizing operational and maintenance practices are some of the primary principles. An essential element of Sustainable Building Design is indoor environmental quality including air quality, illumination, thermal conditions, and acoustics. Interior design, when done correctly, can harness the true power of sustainable architecture. Sustainable Interior Design can be incorporated through various techniques: water efficiency, energy efficiency, using non-toxic, sustainable or recycled materials, using manufactured processes and producing products with more energy efficiency, building longer lasting and better functioning products, designing reusable and recyclable products, following the sustainable design standards and guidelines, and more. For example, a room with large windows too allow for maximum sunlight should have light colored interiors to help bounce the light around and increase comfort levels while reducing light energy requirements. Interior designers must take types of paints, adhesives, and more into consideration during their designing and manufacturing phase so they do not contribute to harmful environmental factors. Choosing whether to use a wood floor to marbled tiled floor or carpeted floor can reduce energy consumption by the level of insulation that they provide. Utilizing materials that can withhold 24-hour health care facilities, such as linoleum, scrubbable cotton wall coverings, recycled carpeting, low toxic adhesive, and more. Every environment and space can incorporate materials and choices to reducing environmental impact, while still providing durability and functionality. The mission to incorporate sustainable interior design into every aspect of life is slowly becoming a reality. Guideline10-2011 addresses the interactions among indoor environmental factors and goes beyond traditional standards. Various acts, such as the Energy Policy act (EPAct) of 2005 and the Energy Independence and Security Act (EISA) of 2007 have been revised and passed to achieve better efforts towards sustainable design. Federal efforts, such as the signing of a Memorandum of Understanding to the commitment of sustainable design and the Executive order 13693 have also worked to achieve these concepts. Various guideline and standard documents have been published for the sake of sustainable interior design and companies like LEED (Leadership in Energy and Environmental Design) are guiding and certifying efforts put into motion to contribute to the mission. Sustainable design of cities is the task of designing and planning the outline of cities such that they have a low carbon footprint, have better air quality, rely on more sustainable sources of energy, and have a healthy relationship with the environment. Sustainable urban planning involves many disciplines, including architecture, engineering, biology, environmental science, materials science, law, transportation, technology, economic development, accounting and finance, and government, among others. This kind of planning also develops innovative and practical approaches to land use and its impact on natural resources. New sustainable solutions for urban planning problems can include green buildings and housing, mixed-use developments, walkability, greenways and open spaces, alternative energy sources such as solar and wind, and transportation options. Good sustainable land use planning helps improve the welfare of people and their communities, shaping their urban areas and neighborhoods into healthier, more efficient spaces. Design and planning of neighbourhoods are a major challenge when creating a favourable urban environment. The challenge is based on the principles of integrated approach to different demands: social, architectural, artistic, economic, sanitary and hygienic. Social demands are aimed at constructing network and placing buildings in order to create favourable conditions for their convenient use. Architectural-artistic solutions are aimed at single spatial composition of an area with the surrounding landscape. Economic demands include rational utilization of area territories. Sanitary and hygienic demands are of more interest in terms of creating sustainable urban areas. Sustainable landscape architecture is a category of sustainable design and energy-efficient landscaping concerned with the planning and design of outdoor space. Plants and materials may be bought from local growers to reduce energy used in transportation. Design techniques include planting trees to shade buildings from the sun or protect them from wind, using local materials, and on-site composting and chipping not only to reduce green waste hauling but to increase organic matter and therefore carbon in the soil. Some designers and gardeners such as Beth Chatto also use drought-resistant plants in arid areas (xeriscaping) and elsewhere so that water is not taken from local landscapes and habitats for irrigation. Water from building roofs may be collected in rain gardens so that the groundwater is recharged, instead of rainfall becoming surface runoff and increasing the risk of flooding. Areas of the garden and landscape can also be allowed to grow wild to encourage bio-diversity. Native animals may also be encouraged in many other ways: by plants which provide food such as nectar and pollen for insects, or roosting or nesting habitats such as trees, or habitats such as ponds for amphibians and aquatic insects. Pesticides, especially persistent pesticides, must be avoided to avoid killing wildlife. Soil fertility can be managed sustainably by the use of many layers of vegetation from trees to ground-cover plants and mulches to increase organic matter and therefore earthworms and mycorrhiza; nitrogen-fixing plants instead of synthetic nitrogen fertilizers; and sustainably harvested seaweed extract to replace micronutrients. Sustainable landscapes and gardens can be productive as well as ornamental, growing food, firewood and craft materials from beautiful places. Sustainable landscape approaches and labels include organic farming and growing, permaculture, agroforestry, forest gardens, agroecology, vegan organic gardening, ecological gardening and climate-friendly gardening. A variety of philosophies, policies and practices have contributed to these goals. People in many different capacities, from farmers to consumers, have shared this vision and contributed to it. Despite the diversity of people and perspectives, the following themes commonly weave through definitions of sustainable agriculture. There are strenuous discussions — among others by the agricultural sector and authorities — if existing pesticide protocols and methods of soil conservation adequately protect topsoil and wildlife. Doubt has risen if these are sustainable, and if agrarian reforms would permit an efficient agriculture with fewer pesticides, therefore reducing the damage to the ecosystem. For more information on the subject of sustainable agriculture: "UC Davis: Sustainable Agriculture Research and Education Program". Automobiles, home appliances and furnitures can be designed for repair and disassembly (for recycling), and constructed from recyclable materials such as steel, aluminum and glass, and renewable materials, such as Zelfo, wood and plastics from natural feedstocks. Careful selection of materials and manufacturing processes can often create products comparable in price and performance to non-sustainable products. Even mild design efforts can greatly increase the sustainable content of manufactured items. The availability, potential, and feasibility of primary renewable energy resources must be analyzed early in the planning process as part of a comprehensive energy plan. The plan must justify energy demand and supply and assess the actual costs and benefits to the local, regional, and global environments. Responsible energy use is fundamental to sustainable development and a sustainable future. Energy management must balance justifiable energy demand with appropriate energy supply. The process couples energy awareness, energy conservation, and energy efficiency with the use of primary renewable energy resources. Sustainable manufacturing can be defined as the creation of a manufactured product through a concurrent improvement in the resulting effect on factory and product sustainability. The concept of sustainable manufacturing demands a renewed design of production systems in order to condition the related sustainability on product life cycle and Factory operations. Designing sustainable production systems imply, on the one hand, the analysis and optimization of intra-factory aspects that are related to manufacturing plants. Such aspects can regard the resource consumption restrain, the process efficiency, the ergonomics for the factory workers, the elimination of hazardous substances, the minimization of factory emissions and waste as well as internal emissions, the integrated management of information in the production facilities, and the technological updating of machines and plants. Other inter-factories aspects concern the sustainable design of manufactured products, product chain dematerialisation, management of the background and foreground supply chains, support of circular economy paradigm, and the labelling for sustainability. Sustainable water technologies have become an important industry segment with several companies now providing important and scalable solutions to supply water in a sustainable manner. Beyond the use of certain technologies, Sustainable Design in Water Management also consists very importantly in correct implementation of concepts. Among one of these principal concepts is the fact normally in developed countries 100% of water destined for consumption, that is not necessarily for drinking purposes, is of potable water quality. This concept of differentiating qualities of water for different purposes has been called "fit-for-purpose". This more rational use of water achieves several economies, that are not only related to water itself, but also the consumption of energy, as to achieve water of drinking quality can be extremely energy intensive for several reasons. Sustainable technologies use less energy, fewer limited resources, do not deplete natural resources, do not directly or indirectly pollute the environment, and can be reused or recycled at the end of their useful life. They may also be technology that help identify areas of growth by giving feedback in terms of data or alerts allowed to be analyzed to improve environmental footprints. There is significant overlap with appropriate technology, which emphasizes the suitability of technology to the context, in particular considering the needs of people in developing countries. However, the most appropriate technology may not be the most sustainable one; and a sustainable technology may have high cost or maintenance requirements that make it unsuitable as an "appropriate technology," as that term is commonly used. “Technology is deeply entrenched in our society; without it, society would immediately collapse. Moreover, technological changes can be perceived as easier to accomplish than lifestyle changes that might be required to solve the problems that we face.” The design of sustainable technology relies heavily on the flow of new information. Sustainable technology such as smart metering systems and intelligent sensors reduce energy consumption and help conserve water. These systems are ones that have more fundamental changes, rather than just switching to simple sustainable designs. Such designing requires constant updates and evolutions, to ensure true environmental sustainability, because the concept of sustainability is ever changing – with regards to our relationship with the environment. A large part of designing sustainable technology involves giving control to the users for their comfort and operation. For example, dimming controls help people adjust the light levels to their comfort. Sectioned lighting and lighting controls let people manipulate their lighting needs without worrying about affecting others – therefore reducing lighting loads. The precursor step to environmentally sustainable development must be a sustainable design. By definition, design is defined as purpose, planning, or intention that exists or is thought to exist behind an action, fact, or material object. Development utilizes design and executes it, helping areas, cities, or places to advance. Sustainable development is that development which adheres to the values of sustainability and provide for the society without endangering the ecosystem and its services. “Without development, design is useless. Without design, development is unusable.” – Florian Popescu, How to bridge the gap between design and development. ^ The End of Unsustainable Design, Jax Wechsler, December 17, 2014. ^ Household waste, Office for National Statistics. ^ Various. "Guiding Principles of Sustainable Design." Chapter 9: Waste Prevention. ^ Anastas, P. L. and Zimmerman, J. B. (2003). "Through the 12 principles of green engineering". Environmental Science and Technology. March 1. 95-101A. ^ Anastas, P. L. and Zimmerman, J. B. (2003). "Through the 12 principles of green engineering". Environmental Science and Technology. March 1. 95-101AAnastas, P. L. and Zimmerman, J. B. (2003). ^ D. Vallero and C. Brasier (2008), Sustainable Design: The Science of Sustainability and Green Engineering. John Wiley and Sons, Inc., Hoboken, NJ, ISBN 0470130628. ^ US DOE 20 yr Global Product & Energy Study Archived 2007-06-08 at the Wayback Machine. ^ Ben-Gal I., Katz R. and Bukchin J., "Robust Eco-Design: A New Application for Quality Engineering", IIE Transactions, Vol. 40 (10), p. 907 - 918. ^ Various. "Guiding Principles of Sustainable Design". THE PRINCIPLES OF SUSTAINABILITY. ^ The End of Unsustainable Design Jax Wechsler, December 17, 2014.The End of Unsustainable Design Jax Wechsler, December 17, 2014. ^ "The Ecothis.eu campaign website". ecothis.eu. Retrieved August 3, 2015. ^ Claire Easley. "Not Pretty? Then It's Not Green". Builder. ^ Fan Shu-Yang, Bill Freedman, and Raymond Cote (2004). "Principles and practice of ecological design Archived 2004-08-14 at the Wayback Machine". Environmental Reviews. 12: 97–112. ^ Meinhold, Bridgette (2013). Urgent Architecture: 40 Sustainable Housing Solutions for a Changing World. W. W. Norton & Company, Inc. ISBN 9780393733587. Retrieved 26 May 2014. ^ Vidal, John (2013-05-07). "Humanitarian intent: Urgent Architecture from ecohomes to shelters – in pictures". The Guardian. theguardian.com. Retrieved 26 May 2014. ^ "URGENT ARCHITECTURE: Inhabitat Interviews Author Bridgette Meinhold About Her New Book". YouTube.com. Retrieved 26 May 2014. ^ "Rolf Disch - SolarArchitektur". more-elements.com. ^ ASHRAE Guideline 10-2011: "Interactions Affecting the Achievement of Acceptable Indoor Environments"
^ "Charter of the New Urbanism". cnu.org. 2015-04-20. ^ "Driehaus Prize". Together, the $200,000 Driehaus Prize and the $50,000 Reed Award represent the most significant recognition for classicism in the contemporary built environment.. Notre Dame School of Architecture. Retrieved 23 March 2014. ^ "Sustainable Interior Designer". ECO Canada. Retrieved 2019-04-17. ^ "Sustainable Design". www.gsa.gov. Retrieved 2019-04-17. ^ Center, Illinois Sustainable Technology. "LibGuides: Sustainable Product Design: Sustainable Design Principles". guides.library.illinois.edu. Retrieved 2019-04-17. ^ US EPA, OA (2013-02-22). "Summary of the Energy Policy Act". US EPA. Retrieved 2019-04-17. ^ "Executive Order -- Planning for Federal Sustainability in the Next Decade". whitehouse.gov. 2015-03-19. Retrieved 2019-04-17. ^ "Guiding Principles for Sustainable Federal Buildings". Energy.gov. Retrieved 2019-04-17. ^ "LEED green building certification | USGBC". new.usgbc.org. Retrieved 2019-04-17. ^ What Is Sustainable Urban Planning?What Is Sustainable Urban Planning? ^ "Renewable Energy Policy Project & CREST Center for Renewable Energy and Sustainable Technology"
^ "Solar energy conversion and storage: Rhodamine B - Fructose photogalvanic cell"
^ Various. "Guiding Principles of Sustainable Design". Chapter 7: Energy Management. ^ "Water recycling & alternative water sources". health.vic.gov.au. Archived from the original on 7 January 2010. ^ "Sustainable Roadmap - Open Innovation". connect.innovateuk.org. 2012. Retrieved December 3, 2012. Chris Hendrickson, Noellette Conway-Schempf, Lester Lave and Francis McMichael. "Introduction to Green Design."